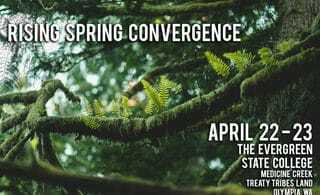 Announcing the Rising S.P.R.I.N.G (Stopping Pipelines and Resisting Infrastructure on Native Ground) Convergence, the weekend of April 22 and 23 at The Evergreen State College on Medicine Creek Treaty Tribes lands in Olympia, WA. This is an opportunity to listen to and learn from indigenous land and water protectors. The convergence is also a space for those with frontlines experience to share their knowledge and to spread skills and analysis. Focusing on direct action and indigenous sovereignty, the weekend will to equip land and water protectors with the skills to resist extractive industry and infrastructure projects and win. We are seeking workshop, training, and discussion proposals. Topics could include: report-backs from recent/ongoing struggles, security culture, direct action tactics and strategy, northwest history (indigenous resistance & eco-defense), and treaty rights. Though we have a limited budget, we want to prioritize compensating indigenous speakers for their time and travel costs. The Black Cottonwood Collective is an anti-authoritarian student group at The Evergreen State College.